Over the last twenty-four hours, I've noticed an explosion in the number of barrack room lawyers across the local weblogs, those quite clearly unable or even unwilling, to distinguish between civil and criminal law; particularly where social media and web-related content is involved. As much as I try and explain the finer principles of the law and why national newspapers, such as The Guardian might take an interest, then many of the usual suspects wander off on subjects such as Tesco, gun ranges and even better, that local Tory councillors drive Bentleys. Naturally these support the inescapable logic of their argument, that there is more to the story than I am prepared to write. But that would make no sense as the papers would soon sniff-out any fibs, so it must remain a puzzle to some. What appears on websites and social media is governed by the revised Defamation and Libel Act of 2013, Civil Law, which clearly described the obligations of a publisher and the the process of remediation, if material is regarded as defamatory or offensive or both. Criminal Law is something far more serious, involves a prosecution rather than civil action and requires a much higher burden of proof to present before a court. As an example, a conspiracy in public life, a serious offense would require a solid audit trail of proof linking the alleged conspirators; documents, remarks, comments, emails etc among the evidence. 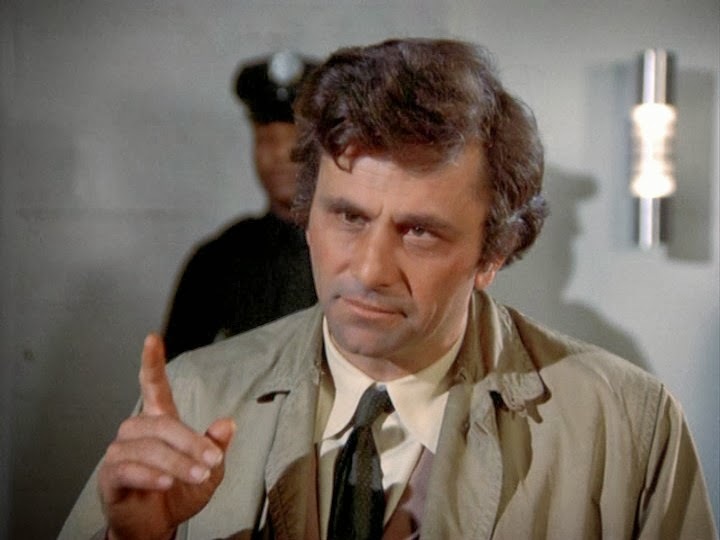 Proof beyond any reasonable doubt would have to be presented to the court, along with motive, opportunity and ability, if you happen to be a fan of detective Columbo. Presently, what has attracted the interest of the media is actually very simple, although I see elsewhere that some people have been distracted by speculation that has absolutely nothing to do with the story itself. What interests the journalists, other than another town Tesco squabble, is whether the police commissioner has acted outside her remit, in resurrecting a complaint that the police originally chose not to pursue and how can one councillor 'Liking' the Facebook comment of another, form part of the evidence chain presented in support of an allegation of conspiracy? "So he 'Liked' a comment on Facebook?" Presently, what we have seen to date, makes no rational sense to the journalists - even today's Independent - and to the three of us on the receiving end of a complaint on the evidence presented. The police don't appear to know either and to be frank, have been quite apologetic but feel under pressure from elsewhere. So they have simply passed the matter up to their own legal advisors to make some sense of it all and make a recommendation on what they should do next. That's it all in a nutshell really. The other characters involved are not really relevant to the questions I'm asking because its the law I'm testing and every active blogger should sit-up and pay attention because the conclusion is absolutely relevant to what they allow, by way of comment on their own weblogs or Facebook pages. 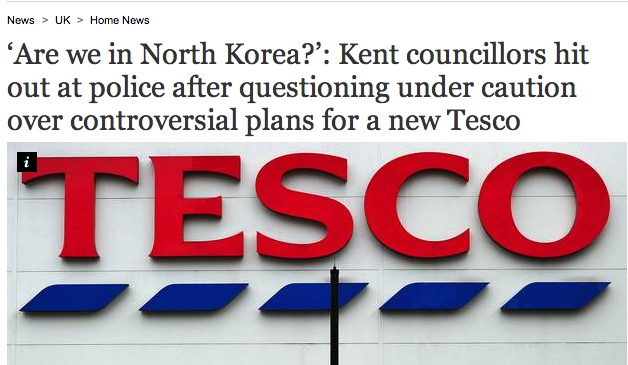 Footnote: Meanwhile, this evening, the local paper, The Thanet Gazette has now waded into the debate by publishing it's own account and taking the extraordinary step, of offering an apparent 'opinion' on the nature of the comments on this weblog. "The comments made reference to Ms Oldfield’s B+B business and her roots in the North of England among other insults as well as claiming that Thanet council was spending money defending Ms Oldfield’s legal challenges." "Insults' is a highly emotive term and is presented as an opinion on the evidence by the paper. Nobody, national press or police, has described any of the remarks here on ThanetLife as being anything other than comments. The press exists to report and press standards are considerably higher than blog standards. By expressing an opinion on an active criminal investigation, it could be interpreted that the Thanet Gazette is acting in a partial and prejudicial manner and I have sent the editor an email asking for her explanation. Simon I wonder why you bother with your council work you get no gratitude only problems. I have in the past encouraged you to continue but now I wonder why youput up with this stuff. In my opinion Anne Barnes is a waste of money and these actions by her if true do nothing to change my opinion. This could and should have been dealt with far simpler in the first instance and bearing in mind I do not know the details it has been blown up and shows no one in a good light. I have always held you in high regard and wiosh you all the best at this time. Two thoughts here Simon one is that cyber bullying is a criminal offence and the other is that it very much depends on what the comment is as to whether liking it could be construed as criminal. Michael.. in this matter the evidence has already been presented under caution. The Facebook remark - without making any direct mention of the person's name - is that the position and scale of the Tesco is misrepresented. The 'Like' is against that by a councillor. My advice is that even at the most extreme end of the interpretation it's fair comment as the remark in question is true and truth is an absolute defence. Thank you Don.. better be careful she doesn't complain about your comment! Sorry Simon, while you are thinking in terms of one individual case, my concerns relate to the general problem of third party comments and likes. What I am trying to point out is that there may be circumstances where liking a comment constitutes a criminal offence and obviously circumstances where comments made by a third party are a criminal offence. This then takes us down the road as blog administrators, particularly with relation to anonymous comments, who would be the criminal, the blog administrator or Google who own the blog. For example if I make a racist comment on your blog and you allow it, does this constitute conspiracy to incite racial hatred? And what if I did it anonymously, would the police be able to extract my identity from Google and my isp or would you carry the can completely? Is there some cut of point above which the crime is so heinous that the police are able to use internet giants to help them find a commentator’s real identity? As I said the whole thing both interests me and concerns me as a blog administrator. There is also the problem that it is possible to publish to the internet in ways that are truly anonymous, for example using wifi raising the question would the person providing the connection be culpable? Simon I think liking something that incited racial hatred could be construed as expressing an opinion that it is illegal to express. We do have freedom of speech, however there are some things that it is a criminal offence to say and some things that when said break civil law. When it comes to cyberbullying there is a bit of a grey area between libel and a criminal offence, however as I understand the situation there is no legal definition of cyberbullying within UK law. My understanding is that it is quite reasonable to report cyberbullying to the police, probably one’s duty, but as there is no legal definition the police would prosecute under the Protection from Harassment Act 1997 or the Malicious Communications Act 1988. Michael, until someone, such as the CPS comes along and attempts to put a tick box on Facebook to the test, I'm pretty comfortable that liking something is not a culpable action but perhaps I may be proved wrong by events. What constitutes an offence involving an illicit comment? If a group of like minded people hold an intelligent debate about race, then almost certainly remarks will be made which others may find offensive. That surely is of itself not an offence. If that debate is overheard and offence is taken what then is the situation in law? Facebook is a place as I understand it where "conversations" can be overheard. I merely play devil's advocate here. My interest in this comes as in regards to Anne Barnes involvement. A. How did she get to be involved, B. Why was she reinstating an investigation that had been dropped. Who advised her to do so etc.etc. I dislike the post not the person and wish it to be removed. Another layer of bureaucracy paid for rather than more coppers on the beat or rather at the expense of less coppers on the beat. Stay with it Simon. You have my support. I wish you well.